* Title: This is product description to be displayed on the web portal & shipping related documents. Max character allowed is 200. 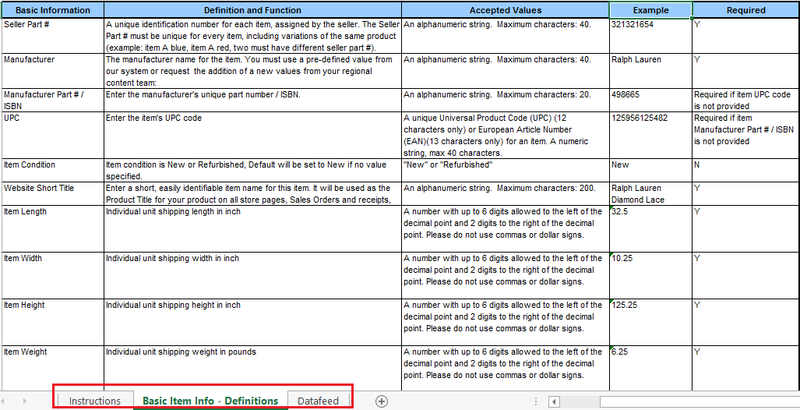 * Seller Part#: Enter SKU# in your database. Max character allowed is 40. * Manufacturer Part Number: Enter Alphanumeric number Manufacturer assigned to this product. Max character allowed is 20. * NPC: NPC stands for Newegg Product Code, which is assigned to each seller part# for inventory management purpose. You can print & apply a NPC barcode label to your merchandise while prepare inventory shipment to Newegg warehouses. Refer to 4. How to send Inventory. * Item Dimensions (by inches): Enter the length, width, and height of each product (in retail package). It is used to estimate shipping cost and find minimal repack carton. Newegg will validate and update the numbers based on product received. Shipping Hazardous Materials: To comply regulations of Transportation in the US, any shipment with hazardous materials must be properly labeled and/or using ground services. 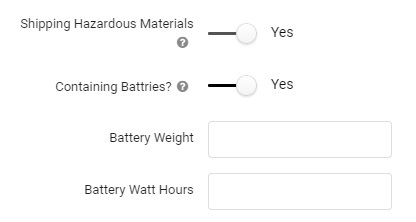 Please indicate if a product contains hazard materials or batteries? For products including batteries, please indicate battery cells by weight and what hour respectively to assure proper service & labeling for your orders. * Package Weight (by pound): Same as dimensions, enter product weight of a single unit in retail packaging. Newegg will validate and update it based on product received. * MSRP: Manufacture Suggest Retail Price or Fair Market Value is used to report customer for international trade. Newegg collects this data first so that you create global orders. * Country of Origin: Same as MSRP, Country of Origin of each product is used to determine tariff and trade restrictions. Newegg collect this data for global orders. Item Image: User can upload product images to assure correct product received and better inventory handling of Newegg Logistic Services. Search and find a specific Item from the search result. Click Edit icon to open item detail page. 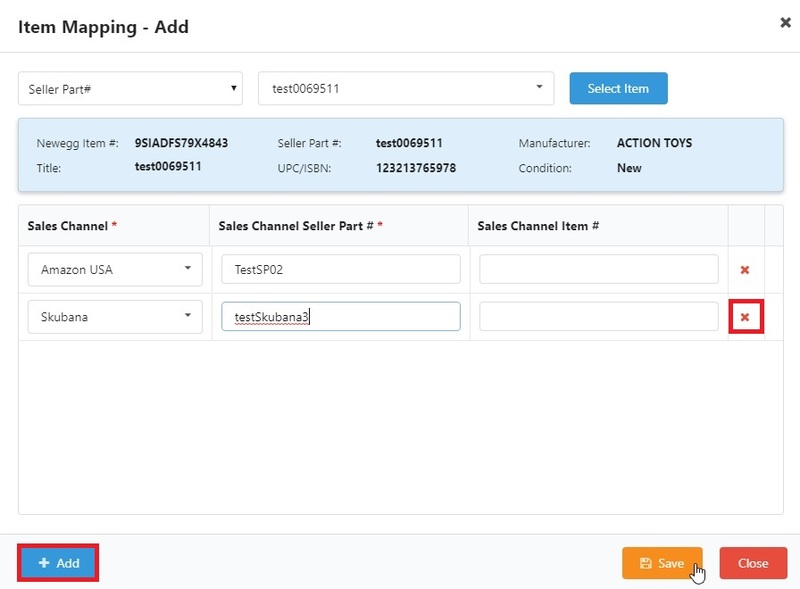 User can change Title, Manufacturer, Manufacturer Part#, UPC, Item Package Dimension or Weight, Inventory Management Type, MSRP and Country of Origin. Then click Save button to make the change effective. Seller Part# cannot be edited. Please go back to Item List result page, and click “X” icon to delete this item first. Then create another item with a new Seller Part#. Please note an Item cannot be deleted when there are still inventory possessed by Newegg warehouses. This is item creation for users who prefer to prepare data offline, and create multiple items at once. 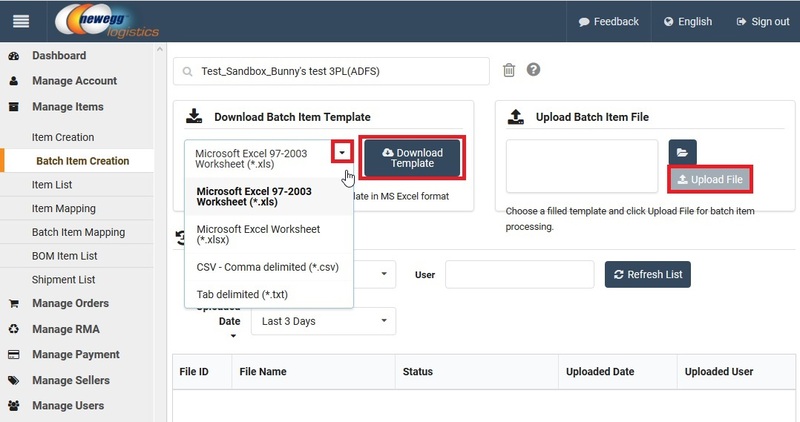 First select a prefer data format you like to work offline, and download the template file. Save the file in your local drive to edit later. Read the instruction & definition of each data field (available in MS Excel template) before working on the file. Some required data must have values, and Newegg uses programming script to validate the SKU details in the file you upload. 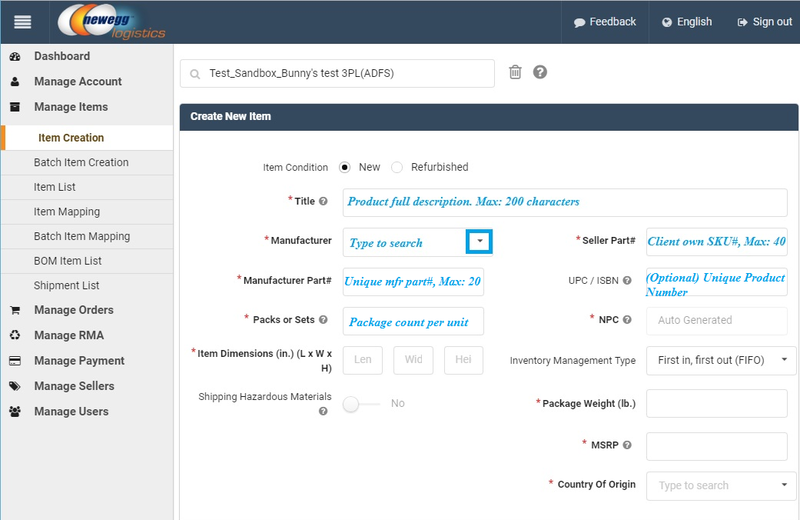 To review items successfully created, user can search item from Item list (Refer to 3b. Item Search & Edit). Clients may list products for sales differently than inventory through varied sales channels. To assure Newegg Logistics Services understand it correctly while updating inventory or retrieving orders, clients must tell us how to map items of each sales channel through this function. 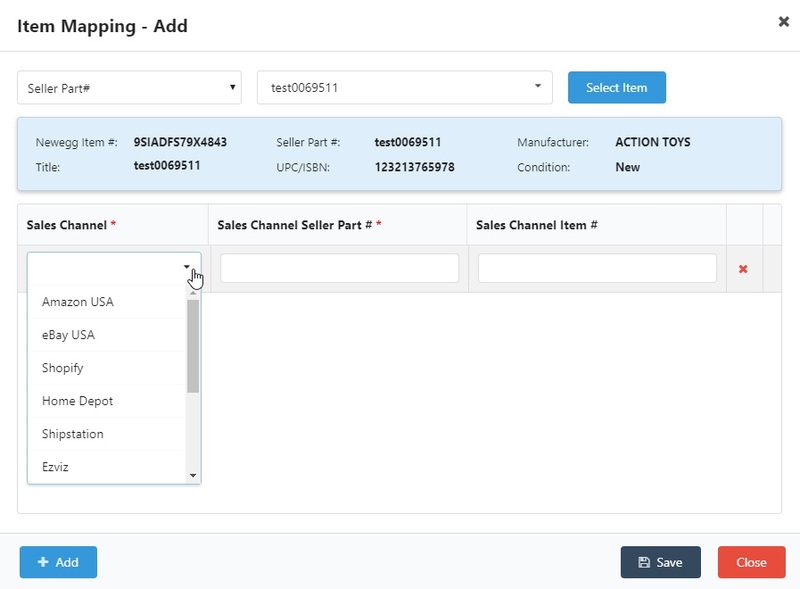 Users can Search existing item mapping by each Sales Channel, or find existing item mapping of different channels by Seller Part#, Newegg Item#, Sales Channel Seller Part# or Sales Channel Item#. 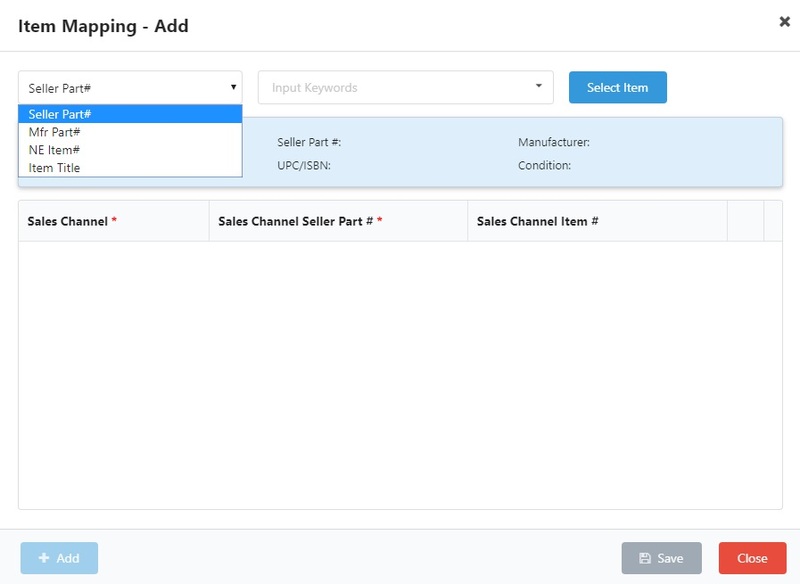 Users can click Create New Mapping button to map listing products of different sales channels to current items. First, select a keyword type (from Seller Part#, Mfr Part#, Newegg Item# or Item Title) you like to search an item. Then, type in keywords and the system will display possible items related to it. Select the right one from the dropdown menu, and click Select Item button. Click Add button to add a new record. Select Sales channel from the dropdown menu (i.e. Amazon USA). Input Seller Part# and Item# listed at that particular channel. Users can continue map the same items listed at another sales channel until completed, and then click Save button. User may click X symbol to delete an outdated/unwanted record. 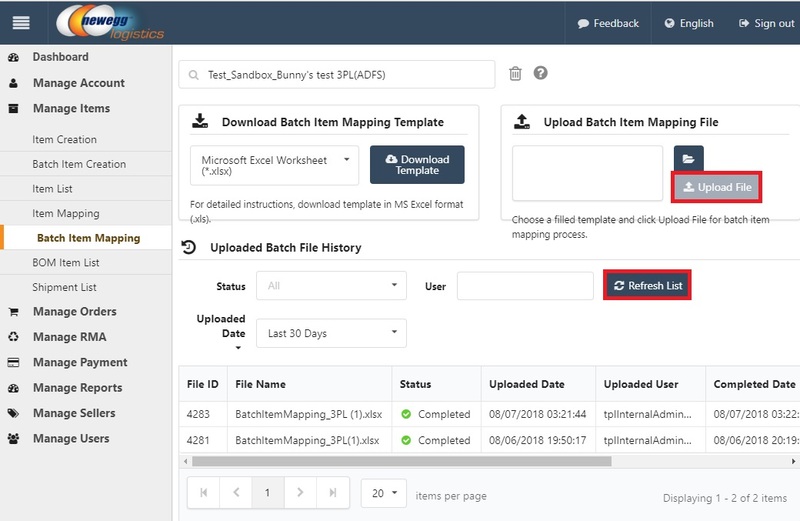 User can create multiple item mapping through a template file offline by going to Batch Item Mapping menu (or clicking Batch Item Mapping button). 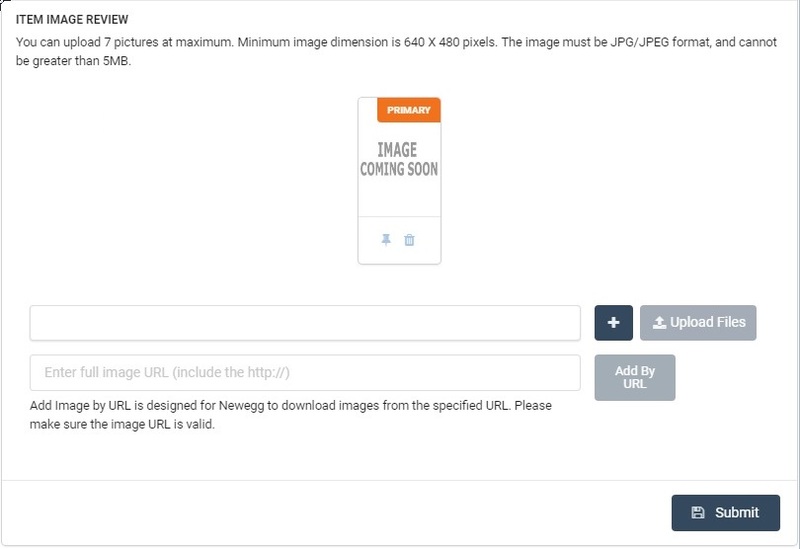 Press Download Template button and save the file to edit later. Read the instruction & definition of each data field (at field definitions Tab) before working on the file. Users complete required data of batch item mapping, and upload it back to Newegg Logistics portal. We use programming script to process the file, and user can view the status of each loaded file at History section below. 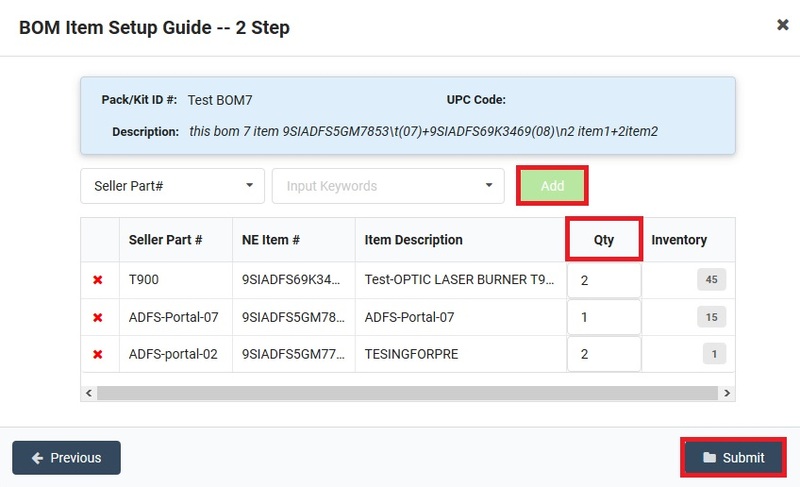 User can click Search button to find existing bundle SKUs, or click New BOM Item to create a new bundle SKU. 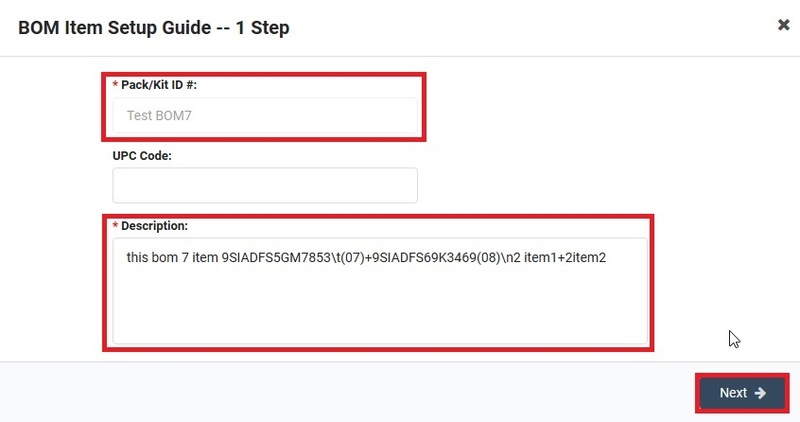 At this step 2, user can search an existing Item (i.e. by Seller Part#), and Add it as a component to the bundle SKU. User can change the Qty of each component from the list below if multiple pieces involved. 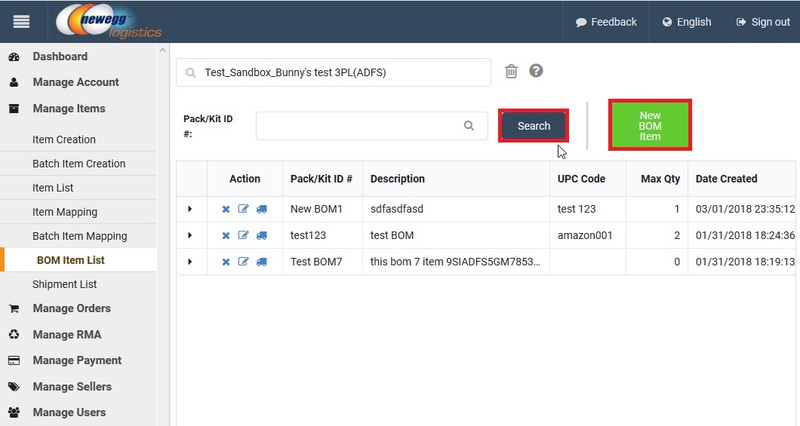 User click Submit button to create a bundle SKU after all components added with associated piece count. User can click Edit icon to view & update any existing bundle, or click Delete icon to delete it.